Apple's running list of providers offering support for single sign-on streaming authentication grew exponentially this week with the addition of 438 cable and satellite television companies, including firms offering services in Guam and the U.S. Virgin Islands. Exactly when the massive feature expansion went live is unknown, and Apple has yet to publicly announce the changes. An official support document covering single sign-on availability, last updated in July, says only 24 providers support the feature. However, iPhone, iPad and Apple TV owners running the latest version of iOS 10 or tvOS 10 can access what appears to be a revised carrier listing from the Settings app. The complete searchable catalog can be found in Settings > TV Provider on iOS and Settings > Accounts > TV Provider > Sign In on tvOS. The apparent expansion focuses on smaller regional providers, but also brings more U.S. territories into the fold with Guam's Docomo Pacific and the Virgin Islands' Innovative Cable TV now listed as supporting services. Announced in June 2016, and launched in December, single sign-on allows pay TV subscribers to log in to third-party video streaming apps using one set of credentials. The feature addresses a major pain point suffered by avid streamers. Without single sign-on, users are forced to enter their cable or satellite TV credentials with each new app download. For example, subscribers of HBO and Disney would have to authenticate the HBO Now and Watch Disney apps, respectively, using a login supplied by their provider. This cumbersome process must be repeated on each owned iOS and tvOS device. Not coincidentally, single sign-on debuted just one week prior to Apple's "TV app," which acts as a content gathering, discovery and viewing hub for supported streaming apps, the iTunes Store and purchased media. Apple's authentication service still lacks integration with major providers Comcast, Spectrum, Verizon, AT&T U-verse and Google Fiber. 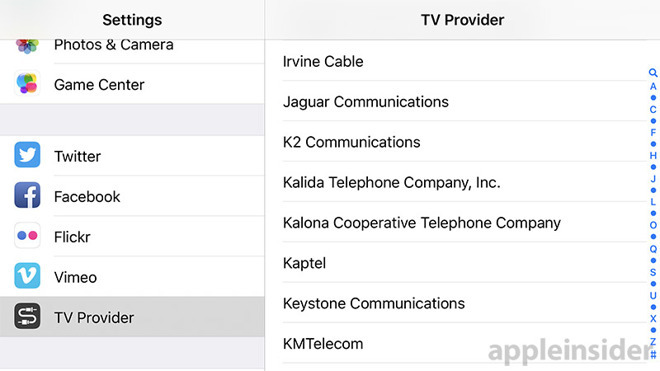 The latest iOS 11 beta release includes those carriers, along with others, in the TV Providers section of the Settings app, suggesting support is incoming.